If there's one type of song every group should have in their repertoire is a patriotic one. Not only for love of country but more practically for performing at sporting events, special occasions, county fairs and such. Yes, you want to sing patriotic songs, but you want them with a bit of a contemporary twist? Then check out these charts by Deke Sharon. 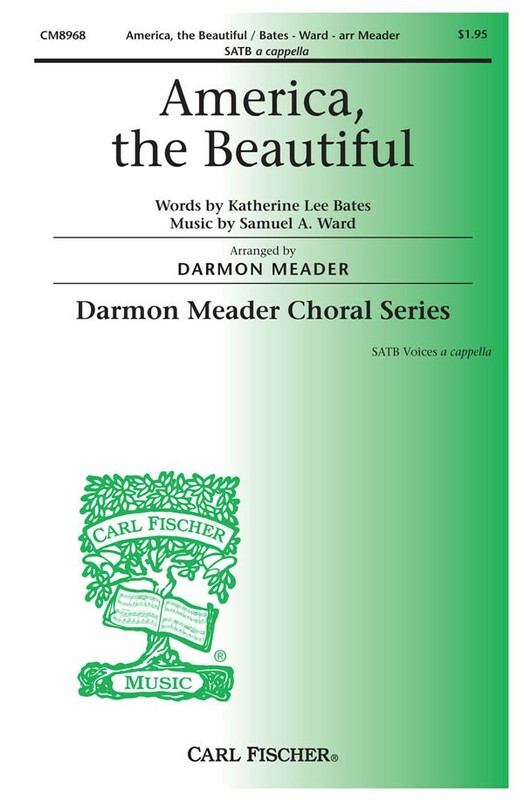 Standard "America The Beautiful" is scored SATB w/solo (alto or baritone), with a 12/8 groove. George M. Cohan's "Yankee Doodel Dandy" is a driving swing, with unexpected syncopations and some whistling with an SSATB voicing. Then there's Neil Diamond's "(Coming to) America" - a contemporary ode to our country of immigrants (SSATB). Lee Greenwood's modern anthem "God Bless The USA" is designed to send shivers down the spines and bring audiences to their feet. And finally, you can rock out to the Steve Miller Band chart "Living In The USA" - SSAB w/tenor solo - with a decidedly more jaundiced view of American culture. A little something for everyone! Widely considered to one of today's top a cappella arrangers Derric Johnson is also one of our favorites. This songbook is a collection of 14 classic American folk songs as for arranged and performed by Derric Johnson's Liberty Voices and which can be heard on their CDs "A Cappella Americana" and "A Slice of A Cappella". To study a Derric Johnson arrangement is to contemplate the canon of a master. Key to his style is his seamless blending of classical choral and jazz idioms that are fresh, yet easy to assimilate. We highly recommend this songbook for most all choirs, ensembles and groups should have a least one Derric Johnson arrangement in their repertoire. Stirring arrangements of two classic and two original patriotic songs. Top arranger Jay Rouse teams up with Randy Vader to create songs that will make any American pround. Songlist: The Star-Spangled Banner, Livin' in the Homeland, Count the Cost (to See That Banner Wave), Battle Hymn of the Republic. From one of the most celebrated arrangers for a cappella here is a set of three patriotic songs that is guaranteed to stir the hearts and voices of performers and audiences alike. For unaccompanied mixed voices. Portraits of America is a collection of eight 2-part choral arrangements with piano accompaniment that celebrate patriotism and spreading a sense of peace, harmony and tolerance throughout the world. Three of the chorals, Land That We Love, Hands 'Cross the Ocean and You're a Grand Old Flag, are arranged as traditional partner songs. Whether celebrating a patriotic holiday such as Veterans' Day, the 4th of July, or selecting music appropriate for concerts for World Peace and Unity, any of these engaging choral works will perfectly augment your commemorative program. Performance/Accompaniment audio recordings and singer PDFs are included via digital download. Songs include: The Promise of America, Land That We Love, All American, Lady of Liberty, You're a Grand Old Flag, Hands 'Cross the Ocean, The Colors of America, Child of the World. Suggested for grades 4-8. Let your patriotic pride shine and develop independent 2-part singing for a winning partnership! John Jacobson and Tom Anderson have partnered up new creative lyrics and singable melodies with patriotic favorites in this spirited collection you will use again and again. Young singers will learn each melody separately, and then sing them together for instant harmonic fun. Watch the excitement grow! The Teacher Edition offers piano/vocal arrangements with choreography, and, for added value, reproducible vocal sheets and teaching objectives linked to the National Standards for each song. Stretch your budget dollars further with the Classroom Kit and receive the Teacher Edition and an ENHANCED CD with performance and accompaniment song tracks, plus PDFs of singer songsheets for projection options! Don't miss this winning collection of spirited originals partnered with patriotic favorites 3-6. Judith Clurman commissioned 16 contemporary composers to write short choral pieces based on the words of 16 American presidents for this collection that combines American history, culture and music. First featured on NPR for President's Day in 2011, this collection is a fantastic resource for choirs, singers and music enthusiasts everywhere! Includes: George Washington Washington Round (Michael Gilbertson), John Adams John Adam's Prayer (Jake Heggie), Thomas Jefferson Opinion Is Power (Larry Hochman), James Madison Round (Milton Babbitt), Andrew Jackson One Man with Courage Makes a Majority (Nico Muhly), Abraham Lincoln The Ballot Is Stronger than the Bullet (Jason Robert Brown), Theodore Roosevelt A Theodore Roosevelt Round (Thomas Cabaniss), Woodrow Wilson I Believe in Democracy (Andrew Lippa), Franklin Delano Roosevelt Admonition of FDR (Samuel Adler), Harry Truman Truman (David Ludwig), Dwight David Eisenhower Eisenhower Round (Paul Moravec), John Fitzgerald Kennedy Freedom's Road (Robert Beaser), Ronald Reagan Moral Courage (Jesse Wiener), William Jefferson Clinton An Ode (Zachary Wadsworth), George W. Bush A Simple Oath (Nora Kroll-Rosenbaum), Barack Obama With Hope and Virtue (Georgia Stitt). One of the first songs any group should have in its repertoire is the Star Spangled Banner as their are plenty of opportunities for an a cappella group to sing the National Anthem. Arranged by some of the top Sweet Adeline arrangers these patriotic songs are fun to sing and suitable for a wide variety of events. "America the Beautiful" and "The Star Spangled Banner" are two of our nation's most beloved patriotic songs. Here we offer a practical and well-crafted collection of top-notch a cappella arrangements for men's voices and there is bound to be at least one that suitable for your group. In an excellent arrangement by David Dickau, the a cappella vocal lines flow easily for each part, providing all the fervor you could want with just enough new material to bring a freshness to the performance. These arrangements are distinctive settings of America's national anthem and are an excellent choice for many performance and civic events. "America the Beautiful" and "The Star Spangled Banner" are two of our nation's most beloved patriotic songs. Here we offer a practical and well-crafted collection of top-notch a cappella arrangements for mixed voices and there is bound to be at least one that suitable for your group. "The Star Spangled Banner" - Kirby Shaw's rich a cappella setting sounds much more difficult than it is, thanks to careful voice leading. It will give a special touch to assemblies or any other performance. David L. Brunner - This fresh new arrangement was written in response to the events of September 11, 2001. Barry Talley - Written for the 2000 Texas All-State Choir, this distinctive setting of America's national anthem is an excellent choice for many performance and civic ceremonies. "America the Beautiful" - Katherine Lee Bates arrangement brings freshness to the familiar, this gospel-tinged a cappella arrangement of the powerful patriotic classic will have audiences out of their chairs and onto their feet. Jack Halloran's unique arranging style brings a special quality to this stirring American patriotic classic. "Lift Your Voice, America" is a distinctive a cappella pairing of "America the Beautiful" and "Battle Hymn of the Republic", this setting is a refreshing change of pace. There's nothing more American than the annual Barbershop Society competition held every July 4th and nobody sings a patriotic tune quite like a barbershop quartet. 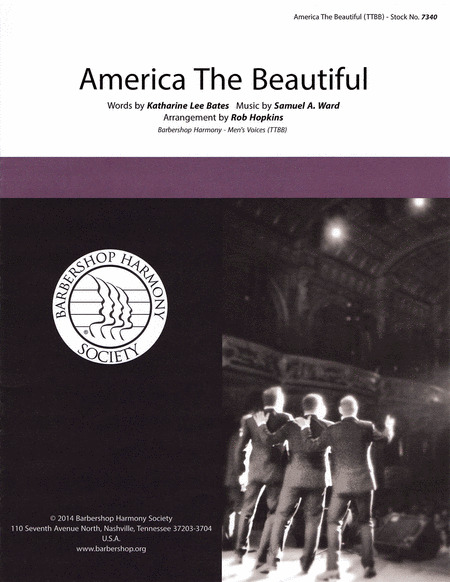 Here is a collection of some of America's finest songs as arranged by some of barbershop's finest arrangers. At least one of these arrangements should be in every quartet's repertoire. More beautifully crafted Barbershop arrangements of classic Patriotic tunes! "God Bless America" and "The Star Spangled Banner" are two of our nation's most beloved patriotic songs. Here we offer a practical and well-crafted selection of top-notch a cappella arrangements for women's voices. These arrangements are distinctive settings of America's national anthem and are an excellent choice for many performance and civic events. "God Bless America" - Ballgames, community events and concert performances - whether you sing the optional opening verse or jump straight to the chorus, this a cappella setting of the beloved patriotic classic by Irving Berlin will fill many programming options! The Grammy-winning singer Kelly Clarkson scored big with an elegant, pitch-perfect and rousing rendition of "The Star-Spangled Banner" at Super Bowl XLVI with choral back-up provided by the Indianapolis Children's Choir, conducted by Henry Leck. Here is the arrangement in two keys, the original in G, as sung by Kelly and a B-flat edition, for use with soprano or tenor soloist, or a group of singers. Displaying 1-50 of 244 items. A vigorous Shaker tune takes on fresh purpose when joined with this original patriotic text. A powerful choral that celebrates the gift of freedom and good citizenship! Available separately: SATB, SAB, 2-Part, Orchestration, StudioTrax CD. Duration: ca. 2:20. With words by Oliver Wendell Holmes, commissioned for the National Peace Jubilee held in Boston in 1869, and original, uplifting music, this work speaks to a nation's desire for healing and reconciliation. Though alluding to Christmas in the final stanza, the work is excellent for ecumenical, patriotic and community performances. Uses: Patriotic, Memorial Composed the week of September 11, 2001 this anthem is an impassioned cry for peace and a testimony of trust in the providence of God. Incorporating The Navy Hymn theme, the new text lifts our eyes to the God who restores, protects and defends. This best-seller has been used in national memorial gatherings and is available with several accompaniment options to maximize flexibility for directors in their programming options. Show your patriotic spirit with this uplifting original. Available: 2-Part, ShowTrax CD. Performance Time: 3:00. 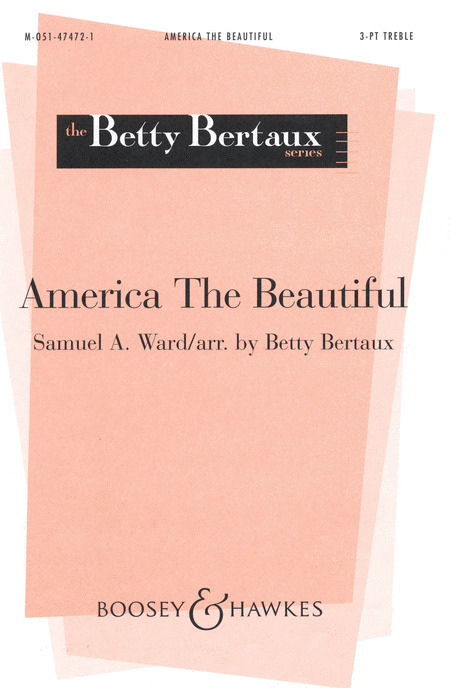 Bold and dignified, this powerful new arrangement of America the Beautiful includes a verse that uses the words of Emma Lazarus' poem, The New Colossus. Words and melody come together to form a breathtaking anthem of patriotism. Accompanied by piano or with the addition of the optional brass quintet and timpani parts, this work will be well received in school, community, and sacred performances alike. Mac Huff : America Sings! Dynamic and spirited contemporary patriotic work rocks with energy from sea to shining sea! Rousing conclusion using strains of My Country 'Tis of Thee unites with bold choral textures. Excellent finale with mass choirs! Available: SATB, SAB, 2-Part, ShowTrax CD, Showcase Video (Choreographed Performance and Production Guide - VHS only). Performance Time: Approx. 4:22. Rhythmic in a gospel style, these two patriotic favorites are joined for a powerful performance. An excellent patriotic choice for concerts or festivals. Available: SATB; 3-Part Mixed; StudioTrax CD. Premiered Inauguration Week on The Oprah Winfrey Show, this song offers an inspiring message of hope at the dawn of a new era and featured an all-star roster of artists: will.i.am, Faith Hill, Bono, Mary J. Blige and David Foster. Perfect for all types of concerts, community and mass choir events. Available separately: SATB, SAB, 2-Part, ShowTrax CD. Combo parts available digitally (tpt1, tpt2, tsx, tbn, syn, gtr, b, dm). Duration: ca. 4:35. Our beloved patriotic hymn could not be more beautiful than in this incomparable setting. With a minimum of divisi and some exquisite solo spots, this is singable by virtually any SATB choir. Of the many arrangements of this hymn available, this is in a class by itself. Bringing freshness to the familiar, this gospel-tinged a cappella arrangement of the powerful patriotic classic will have audiences out of their chairs and onto their feet. The beloved American hymn in a graceful and inspired setting includes an inspirational quotation by Abraham Lincoln. This arrangement by John Leavitt is ideal for many concert occasions.Available separately: SATB, SAB, TTBB, 2-Part, ShowTrax CD and Instrumental Pak (includes score and parts for full orchestra). Performance Time: Approx. 4:45. Jack Halloran's unique arranging style brings a special quality to this stirring American patriotic classic. Prepare to be moved! Set in a soulful gospel style, this setting of the American classic is guaranteed to lift hearts, minds and spirits! Incorporating a snippet of My Country 'Tis of Thee, the full choral harmonies and powerful gospel accompaniment will bring your audience to its feet! Available separately: SATB, SAB, 2-Part, ShowTrax CD. Rhythm Section parts available digitally (p, b, dm). Duration: ca. 4:00. Uses: Patriotic Scripture: II Chronicles 7:14; Psalm 33:12 This beloved patriotic anthem is presented with a dignified reverence. After an opening flourish, the verse unfolds simply, and then increases color in the harmonies. The next verse features some special vocal effects imitating a plucked guitar. A triumphant, bold spirit characterizes the finale, and a return of the opening gesture is just the right exclamation point. Here is a stirring rendition of the patriotic favorite for developing choirs, with optional narration. And it's a great introduction to the descant! Available: 2-Part, 3-Part Mixed. This moving arrangement was performed by the Children's Chorus of Maryland at the National Tribute Memorial Service for Fallen Firefighters in October 2002, honoring over 400 men and women who perished in 2001 while performing acts of bravery and heroism. A stunning, concert-worthy arrangement utilizing three verses of the original text, it builds to a dramatic, maestoso ending. Listen to the exquisite recording provided by the commissioning choir. America has, for hundreds of years, been a country built on tradition, the most powerful of which may be the hope that their children might have a better life. Father/daughter songwriting team Laurie and Larry Hochman have created a tribute to the American dream that connects the past, present and future, framed with the treasured America the Beautiful. Ideal for schools and community concerts for all levels! Jill Gallina creates sweet melodies and thoughtful lyrics with her original works and this is no exception. American Pride exudes love for the beautiful landscape of our country, the United States of America. Commissioned by the award-winning Jenison Choirs of Michigan, this choral will be an outstanding patriotic selection for your choir. Available: SATB, SAB, 2-part, StudioTrax CD. The musical story of a young America struggling to be free! From the powerful Simple Gifts opening to the conclusion of Shenandoah, enjoy a multi-colored tapestry of 20 folk classics with brief narration. An ideal festival work! Available: SATB, 2-Part, ShowTrax CD. Performance Time: Approx. 15:30. Two patriotic blockbusters are fused here in an exciting gospel style. The 3/4 meter and chord progressions create a fresh feel to these classics. The solo with an original melody is paired with the established text in the 4/4 meter section, leading into a strong and powerful ending that uses descant. Perfect for mass choir numbers and finale selections. Available separately: SATB, SAB, 2-part, StudioTrax CD. Duration: ca. 3:38. Uses: Patriotic, Memorial Day Scripture: Genesis 18:18; I Chronicles 16:28 Raise the flag for a grand commemoration of our heritage of freedom in this medley featuring some of the most celebrated patriotic songs. From This Is My Country to God Bless America, this essential repertoire for concerts pays homage to our nation. The idiomatic orchestration adds to the fun and gives directors creative options for their presentation of this exciting work. Invite the audience to join in the final chorus for a sure-fire winner! Here is a powerful and inspirational patriotic trilogy that includes: America the Beautiful, Golden Dream (from EPCOT Center's American Adventure), and Battle Hymn of the Republic. Available: SATB, SAB, 2-Part, Instrumental Pak, ShowTrax Cassette. Performance Time: Approx. 6:10.